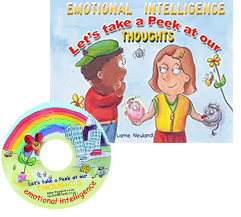 The educator’s input on the absorbing mind is huge and these products assist them in teaching children how to understand and deal with their thoughts and emotions. The winning publication LET’S TAKE A PEEK AT OUR THOUGHTS and the ACTIVITY GUIDE are a great package to grow happy positive kids! The toy thoughts, Love and Grouch, assist educators to discipline learners in a positive way without anger or damaging remarks. This builds the child’s belief in himself, an essential premise to becoming a well adjusted, positive child. 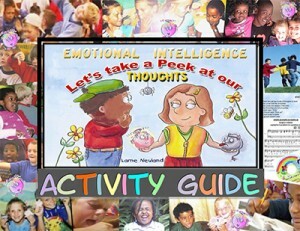 The Activity Guide provides an easy way to teach children about their thoughts and feelings on a level they understand. 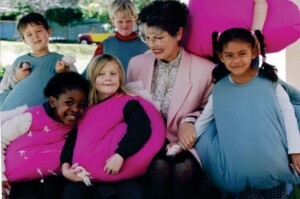 To provide tools to teach children ‘values education’. To promote healthy relationships with Emotional Intelligence. To institute a first generation of ‘Emotionally Intelligent’ young people. Children can learn to understand and discipline their thoughts and feelings. This innovative program is an ideal opportunity for schools and education centres to incorporate as an added dimension to their current curriculum.